Digital technology opens up a world of possibilities when applied to Neumann's classic KM-series microphones. Neumann's first serious incursion into the world of the 'digital microphone', the Solution-D project, resulted in the D-01: a large-diaphragm, variable-pattern mic. Although this looks much like any other large-diaphragm Neumann mic, it provides a direct digital output, generated by some very sophisticated and innovative internal electronics. This mic's technical specifications are very impressive and compare favourably with conventional 'analogue' capacitor mics, achieving a dynamic range of over 130dB. It was clear from the outset that the D-01 was going to be but the first of many Neumann digital mics, and the same technology has now been applied to a range of fixed-pattern small-diaphragm mics, based closely on the capsules used in the popular KM180 series. The new KM-D range has been launched with three models which closely resemble the original analogue KM180 series, both physically and in their model numbering. However, unlike their namesakes, the digital models are, in fact, modular, with removable capsules similar to those found on the KM100 series. The new range is based around the KM-D body, which contains the digital head-amp and output stage. It comes in one of two coloured versions: a classic nickel or a black Nextel finish. The KM-D body can be combined with any of three interchangeable capsules to form the KM183D omni, KM184D cardioid and KM185D supercardioid mics. Neumann have already suggested that four more capsules will be added to the range later this year, along with various extension tubes and other accessories, so the KM-D series will eventually become as versatile as the current KM100 analogue series. For this review, I was supplied only with the cardioid KM184D version, but with two different kinds of output interface and the bespoke remote control software. 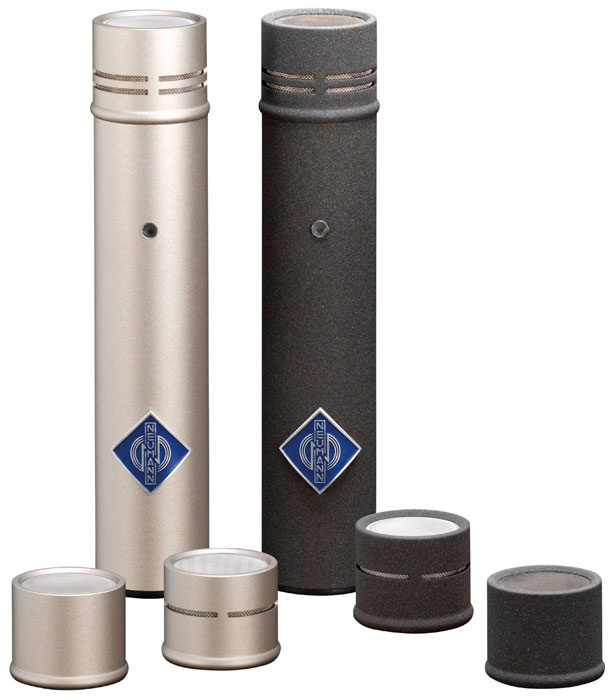 The most critical element of any digital mic is inevitably the A-D converter stage, and Neumann's innovative approach has been developed specifically to achieve a dynamic range exceeding that of a normal capacitor capsule, while remaining as linear, transparent and neutral as possible. Attaining such a goal is impressive enough, but to do so with circuitry small enough to be incorporated within the body of a compact mic like the KM-D is a mind-blowing achievement. The A-D converter uses a very clever technique to provide genuine 28-bit resolution for the capsule's signal, although this is subsequently scaled internally to optimise the headroom and noise performance within a standard 24-bit output. The A-weighted dynamic range with a real capsule as the source is 133dB, and with the A-D's input shorted out the converter achieves a stunning 140dB! The system is necessarily complicated in detail, but the essence of the process is that the output from the capsule is first compressed in a specific way so as to prevent overloading of the primary A-D converter. The amount of compression applied is encoded by a separate A-D stage and simple digital signal processing is then used to restore the signal's original dynamics by adding the two signals. Cleverly, this approach simultaneously and completely cancels out any distortion products resulting from this non-linear compansion process, leaving a very clean output signal with a huge dynamic range. When the capsule signal is well within the linear part of the first A-D stage, and no compression is being applied, the output of the 'compression amount' A-D is ignored to remove any potential noise contribution from that source, further extending the dynamic range downwards. The review model was the cardioid KM184D, pictured left. Also available are the KM183D (diffuse-field equalized pressure transducer with a free-field treble boost) and KM185D (hypercardioid) and all are available in either black or nickel finish. The KMD mic body is available separately, as are the interchangeable capsules (KK183, KK184 and KK185). Further capsules are anticipated. Given all this sophisticated conversion circuitry, it seems almost disappointing to discover that the digital output is provided via an ordinary-looking XLR3 connector at the base of the mic. However, the signal format employed here conforms to the relatively new AES42 specification, and it will not come as a surprise to learn that Neumann were instrumental in the development of this interface, which is an extension of the more familiar AES3 (AES-EBU) interface. One of the key differences is that AES42 carries a unique form of phantom powering, in which the 10V supply is modulated with various control and synchronisation signals. These allow remote control of the mic's parameters, and can determine the sampling rate and clock synchronisation. The KM-D series mics can be operated at any standard sampling frequency between 44.1 and 192 kHz, but straight out of the box, they are configured with a preset default sample rate and operating characteristics. The review model was initially preset to 96kHz, for example. Currently, there are two ways to connect the KM-D series mics to a digital sound desk or recorder. The simplest arrangement is to use the mic in its stand-alone configuration, which involves one of two small adaptor boxes that plug into the base of the mic and allow connection with conventional digital audio equipment. One version converts the mic's AES42 output signal into standard AES3, while the other provides S/PDIF. The appropriate digital output is provided via a flying lead, and a very compact 12V DC 'wall-wart' supply powers the adaptor. A battery-pack version is also available as an option. However, these simple adaptor boxes don't incorporate any facilities to control the mic's internal DSP parameters, or to synchronise the digital output to an external clock. They only permit 'stand-alone' operation, with the mic operating according to its predefined default configuration. To get the most out of the KM184D, you'll want the DMI2, which can control two microphones. Remote control of the mic's parameters is via one of two RJ45 sockets on the back of the unit. These provide an RS485-based interface which can be daisy-chained across multiple DMI2 units. A computer can also be hooked up to the system via a supplied RS485 USB adaptor plug. A far more versatile configuration is obtained by using Neumann's free-standing mains-powered DMI2 unit, which can handle two mics simultaneously. This interface has sockets on the rear panel for two AES42 inputs from the mics, each with a corresponding AES3 output. There are also BNC connectors for word clock in and out to enable external sample-rate synchronisation, and a nine-pin D-sub socket allows simple wired remote switch operation of some parameters, such as muting the output to provide a 'cough switch'. If two mics are connected to the DMI unit and synchronised to a common external word clock, the first AES3 output socket carries one mic's signal in the left channel and the other in the right, which facilitates a simple stereo connection with a desk or recorder. Remote control of the mic's parameters is via one of two RJ45 sockets on the back of the unit. These provide an RS485-based interface which can be daisy-chained across multiple DMI2 units. A computer can be hooked up to the system via a supplied RS485-to-USB adaptor plug. 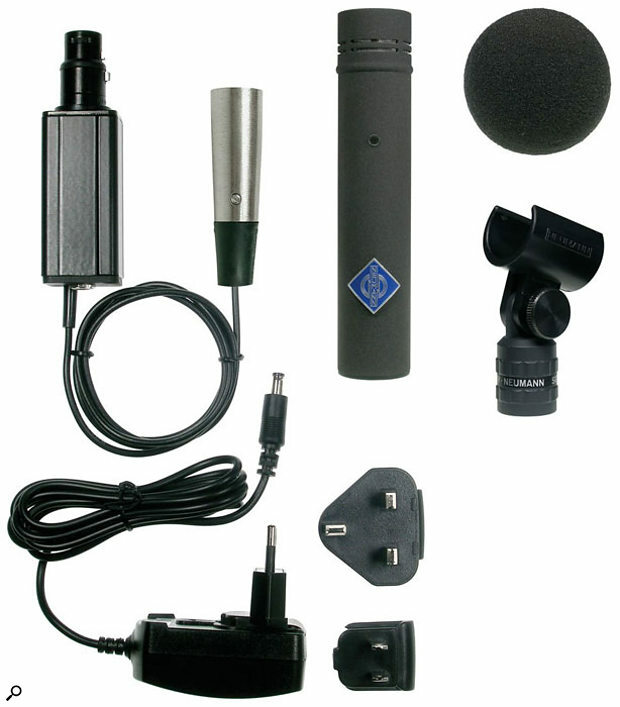 Part of the AES-42 specification is that all digital microphones transmit, along with the audio output, data about the manufacturer, the model, the serial number, the software version, a list of all remote-control functions, and status indicators. Eventually, when digital consoles are equipped with AES42 inputs, they will also have generic on-board remote control facilities to configure any digital mic. However, that happy day is still quite a way off, I suspect, and until then the only solution is to use Neumann's bespoke Remote Control Software (RCS), which is supplied with the mic, from a laptop or other computer hooked into the DMI2. The RCS software. The RCS software is able to recognise and control any of Neumann's Solution-D microphones, with all parameters, including signal levels and gain reduction, displayed and controlled directly from the screen graphics. A text field is also incorporated for channel naming. There is a surprising range of parameters and functions available in the KM-D mic, starting with the ability to alter its sensitivity via settings for pre-attenuation (up to 18dB in 6dB steps) and gain (up to 63dB in 1dB steps). It obviously makes sense to perform these functions on the source 28-bit signal from the capsule, rather than in a sound desk on its 24-bit output. More familiar facilities are also included, such as polarity inversion and output muting. There are also several rather unusual features: for example, there are three built-in test signals that can be generated internally to help prove circuit connections and set levels, and the blue LED on the mic's body can be switched on and off remotely to serve as a signalling light! Perhaps more surprising is that the mic's DSP software includes a fully controllable peak limiter and a separate compressor, both with a wide range of adjustable parameters. The compressor even has side-chain equalisation facilities to permit operation as a de-esser. The configurations of all of these features and facilities can be saved and recalled as RCS presets in the host computer, and one complete set can be downloaded into the mic's internal DSP memory to serve as the default configuration when the mic used in a 'stand-alone' mode. The Solution-D concept is a very good one. Converting the capsule's analogue output to a digital form within the mic body ensures that the delicate signal is protected and secured at the earliest possible stage. It also completely removes all the analogue problems of degradation by long mic cables, colouration from preamplifiers, and limited resolution of conventional A-D converters. Naturally, this all assumes that the internal converter circuitry is up to the task, and here Neumann have provided an excellent and innovative solution. The specifications certainly suggest that the goal has been met: the KM184D has the same self-noise as the conventional KM184, because it uses the same capsule, but a significantly higher maximum SPL (144dB versus 138dB). The starter kit provides the simplest way to get started with the KM184D. There are two versions available: one version converts the mic's AES42 output signal into standard AES3, while the other provides S/PDIF. The appropriate digital output is provided via a flying lead, and a very compact 12V DC 'wall-wart' supply powers the adapter. A battery-pack version is also available as an option. I compared the sound of the digital KM184D alongside my own standard analogue KM184, and to give the latter the best possible chance, I partnered it with a GML 8400 preamp and Benchmark ADC1 converter — the best and most neutral preamp and converter I had available. The mics were placed alongside each other and the digital outputs from the DMI2 and the ADC1 were passed to a Yamaha DM1000 console. I have to be honest and say that, even when switching directly between the two signals, I struggled to tell which mic was which, regardless of the source I chose (whether speech, vocals, acoustic guitar, or 'cello)! The sonic characteristics were exactly the same — the presence peak, the well-controlled polar pattern, the smooth bass roll-off, the transient detail and the transparency. The only difference (although it is quite significant) that I found was that it was very much harder to overload the KM184D. In fact, when the limiter had been set up carefully, it was pretty much impossible! However, the dynamics facilities also present a potential trap. The built-in limiter and compressor are both virtually transparent in operation, and that makes it surprisingly easy to get the gain structure completely wrongly without it being immediately obvious. I have come across this problem on some large-format digital mixing consoles, too: well-designed digital dynamics processors can be so transparent that your ears give little clue that they are working, even when they are working hard, and so it is scarily easy to overlook excessive input gain! Of course, proper gain-reduction metering is provided by the RCS software, so it is quite straightforward to optimise the settings when using that with the DMI2 interface, but if you are using the mics in their 'stand-alone' mode, with the simple connection kit, you have to have faith that the default sensitivity and dynamics settings have been chosen appropriately. The KM184D and its siblings might initially seem very expensive for a small-diaphragm microphone, even one with the famous diamond logo on the front! But once you've factored in a state-of-the-art mic preamp and converter, as well as a sophisticated dynamics processor, it actually starts to look like something of a bargain, even with the additional cost of a DMI2 for each pair of mics. Of course, eventually, when the mixing console manufacturers start offering AES42 interfaces, the KMD-series mics will become an extremely cost-effective way to capture and maintain the highest-quality sound. I was mightily impressed and have mentally added the KMD range to the top of my microphone wish-list. My only hesitation is that I'd like to see what other capsules will be provided in the near future. Nonetheless, I thoroughly recommend checking out this impressive new microphone and its associated technology. Although there have been digital mics in the past, such as Beyer's MCD100, nothing has come close to the KM-D series and it has to be said that at the time of writing there really is no direct alternative. Extremely clean direct digital output. Ability to optimise signal levels at the capsule. The simple interfaces have no digital synchronisation features. There are no consoles yet with AES42 interfaces. An all-digital state-of-the-art microphone that really does exceed the capabilities of its analogue siblings. Impressive. KM184D (one mic with no accessories) £986; Starter Packs £1109.14; stereo pairs £1972.77; DMI2 controller £739.